Native Americans realized the medicinal potential of the root of the black cohosh plant hundreds of years ago. They used it to help relieve menstrual symptoms such as cramps, water retention, and hot flashes associated with PMS and menopause. Today it is still used as a herbal solution by many women who believe in its abilities to combat all of these symptoms as well as mood swings, sleep irregularities and backaches. 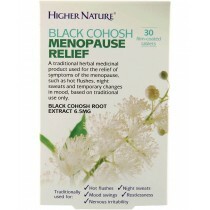 Black cohosh is also said to be an anti-inflammatory agent, making it popular among sufferers of various types of arthritis and neuralgia. Although it is relatively unknown, some scientists and homeopathic and herbal medical practitioners say that it is a wonder cure. It should be avoided during pregnancy however, because it is known to induce labour because of its estrogenic activity. For those who do not wish to introduce synthetic substances into their bodies, black cohosh herbal supplements are available in easy to swallow tablets and capsules.